With our TV-DEX, high quality audio is streamed with no delay straight to your hearing aid. Room Off: With the TV-DEX you can temporarily switch the hearing aid’s microphone off and hear the TV sound only - we call this ‘Room Off’ - meaning you can enjoy your favourite TV programme without unnecessary background noise. 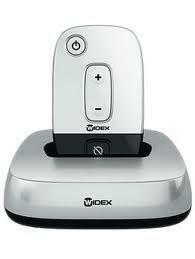 The TV-DEX is compatible with the following hearing aid series: Clear ad Super.